Finding interesting and meaningful activities for Owen and Cora during Maddy’s homework time has kept me busy lately, but I’ve found tons of great things for these two to do. Finally, it’s a natural part of our day for everyone to sit down for ‘work time’ after snacks. 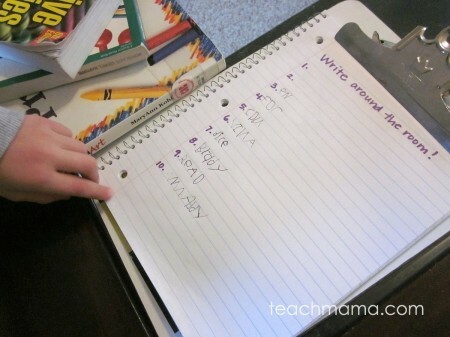 Recently, I pulled out an oldie but a goodie for Owen: Write Around The Room. He loved it. Loooved it. And it’s really super simple. So we’ll certainly pull it out again this week or next. Give a guy a clipboard, some paper, and a pen, and he’s happy. At least for a while. 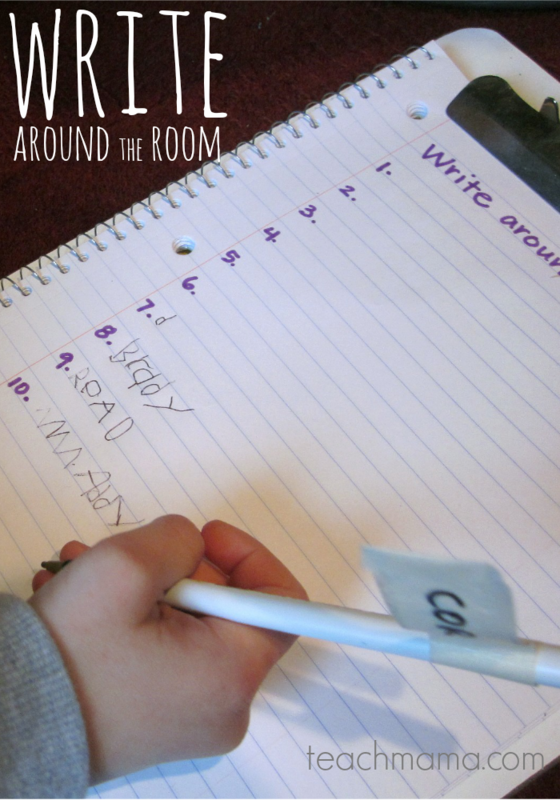 Write Around the Room: Write Around the Room is just that–giving kiddos the task of writing the words that they see in any room. It’s great for a classroom, where there’s a Word Wall, a huge calendar, and children’s work, posters, and signs, but it works just fine even at home. It’s funny what they can actually find in the rooms you spend so much time in every day. And all kiddos need is some paper–Owen used his own personal notebook–and a pen. My kids love themselves a clipboard, so I clipped the notebook in, and Owen was ready to go! I said, Okay, today, Owen you can do a ‘Write Around the Room’ for your work time. Grab your notebook and a clipboard, a pen, and your detective eyes, and I’ll tell you how to do it. He scrambled for his supplies, and when he found everything, I explained what to do: For a Write Around the Room, you do just that–you write the best words you can find around the room. But you need your strongest detective eyes so that you can pick out only the best words you can. And once you find a word, you write it on your paper here. Your goal–and I’m not sure you can do this because 10 is pretty many words–but your goal is to find 10 words. Be sure to copy the letters exactly, and when you find them all, come back and we’ll read them together. So he did. His words were found in our work room and in our living room, and he really did use his best detective eyes! He found words on the sides of boxes, on papers, and on our Wii! When he was finished, we read them together. I wasn’t sure where he found some–but he was able to point them out. Although ‘en’ and ‘cdu’ were initials on boxes and a paper, he got the idea. Owen’s Write Around the Room list. Number one word? Wii. Yikes. And because Owen cannot decode the words himself at this point, he totally understands that a bunch of letters grouped together is a word–and that’s half the battle of reading! Owen’s heading to Kindergarten next year (wah! ), so he should be practicing his letters and some simple sight words at this point. Something as simple as Write Around the Room gets him moving, practicing his letter writing, and challenging his hand-eye coordination. 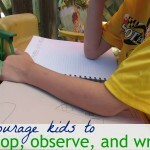 Although our goal for getting our kiddos to write is to find authentic writing experiences, something contrived like Write Around the Room is fine–it’s great!–to use as an activity to get them paying attention to the words around them because it’s sometimes a loooong journey from scribble to word. from Schickedanz, J.A., & Casbergue, R.M. (2009). Assessing Writing Development in the Early Years. In Writing in Preschool (pp. 75-87). Newark, DE: International Reading Association. So what can we as parents do to support our little learners’ letter writing? 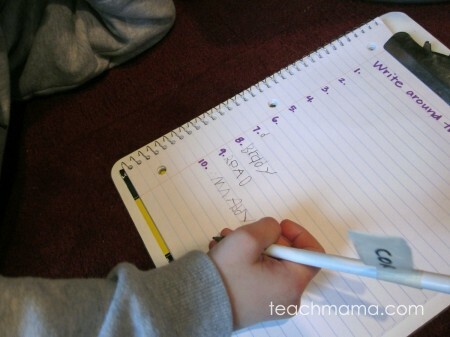 We can help them develop their fine motor skills, practice their sweet names, and do a little early-writing practice. Or we can just continue reading, print referencing, and creating word conscious kids–everything we do helps, my friends. Really! Many thanks to the above article and Duke, N.K., Purcell-Gates, V., Hall, L.A., & Tower, C. Authentic Literacy Activities for Developing Comprehension and Writing. The Reading Teacher, (2006, December) for information for this post. Have fun and feel free to link up any other ideas you have–I’m always up for more sneaky fun ways of spending time with my kiddos! Love this idea Amy!!!! I can’t wait to give it a go with both of my kids this afternoon! Thanks for the fun activity! What a simply fun idea! I really enjoyed how you described developmentally appropriate writing for preschoolers at the end of this article. 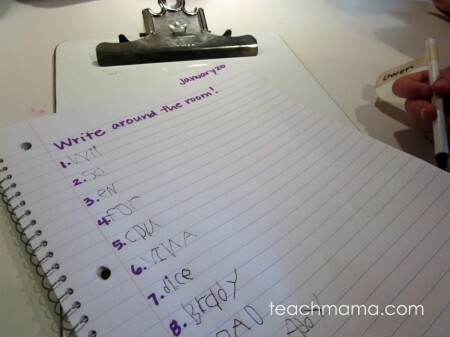 It seems that there is such a push for kids to write all their letters before Kindergarten!! I’ve even seen K teachers shake their heads with disappointment and say, “he can’t even write his letters.” It seems sometimes in the push to do everything earlier, we forget what our expectations should be for preschoolers. I love that you made this fun for him (by making him a detective) and made it appropriate to his age (by letting him copy and accepting his approximations.) Also, as a fellow literacy blogger, I’m so glad you took the extra time to include the research at the end. It’s very interesting! I’m kinda gushing over your blog today, but keep up the great posts!!! You are so awesome to take a minute to give me some feedback; you know how much it means, as we’re all so busy and can barely finish one task at hand. :*) Thank you, thank you!! I always think that it’s one thing to write about a topic, but it’s another to provide the research to back it–I suppose I’m a hard sell on things, so I like to put it out there up front. . . .
Best to you, my friend–and keep up the fab work on YOUR blog, too! I’m excited about this activity. I can see applications for ESL students as well. And it’s inspiring to see the Continuum of Writing Development. My two year old is at the letter awareness rather than word awareness stage (although she’ll sometimes mock-read books), and this gives me ideas about how to support her development along the continuum. I get so many great ideas from your website! (Today we were playing match-the-clothes-pin-to-domino-card number game — at her level.) Count me as another enthusiast! OH my gosh–Marie! Thanks so much for writing–and so glad you can use pieces of the activities here and adapt them for your daughter–let me know how they go!! This is such a neat idea! I love the way it incorporates words into a game and makes it fun. thanks, Susan!! Always appreciate your kind words and feedback! Neat activity–I’m going to share it. It is so interesting for me–I’m very hands-off with my kids on formal reading and writing…but my four year just picked it up from the air. She wrote all her letters when she was two. Now that she is four she is a word-writing machine. My two year old is progressing at a more typical pace…he mimics his sister and tells me he is “making a ‘T'” but it is his fun little scribbles. He has started picking out letters and showing more of an interest in the alphabet. They’ll all get there when they’re ready! WOW – I really like this – and I think it can work with older kids, too! You know that bit about how every scribble is different reminded me of one of my favorite picture books, peter reynold’s THE DOT. It’s really fantastic. you’re welcome, Lee! Hope it helps a little–and I agree–I think it’s be great especially in a foreign language class. . .